It’s no surprise: crowdfunding is one of the most effective ways to fundraise for college causes. However, did you know there’s an even more effective crowdfunding strategy that’s growing in popularity among students and schools alike? T-shirt crowdfunding is an up-and-coming college fundraising method that’s gaining traction among fundraisers as well as donors. Since fundraisers are able to sell apparel on their crowdfunding pages, donors are uniquely inclined to contribute to these campaigns since they’ll receive a product in return. For schools and students looking for a college crowdfunding platform that offers supporters the ultimate freedom in how they contribute, t-shirt fundraising is a top-choice solution. How does t-shirt crowdfunding for universities work? How can universities sell t-shirts to crowdfund for their school? How can individual students use t-shirt crowdfunding to make a difference? Are you ready to revitalize the way you approach college crowdfunding? Get started by checking out these answers to your biggest t-shirt fundraising questions! 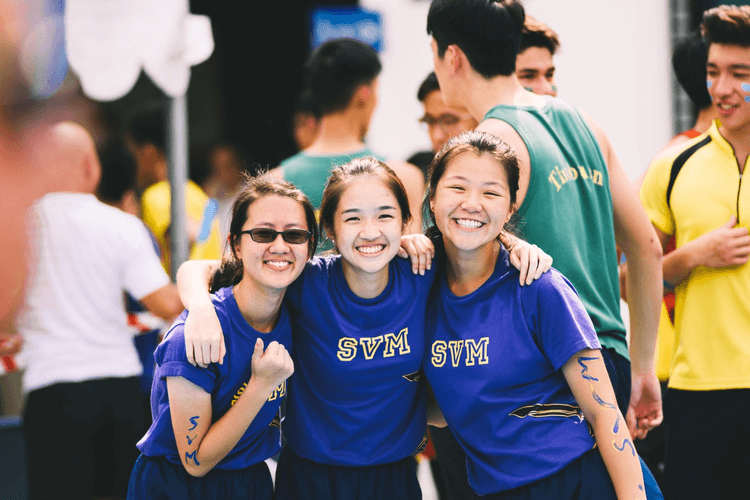 One of the reasons why schools and students prefer t-shirt crowdfunding over traditional fundraising methods is because the process is so simple to get right. 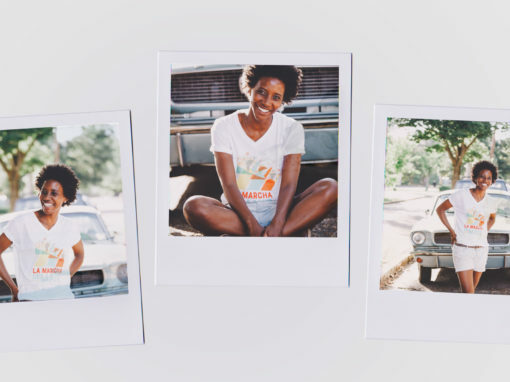 Through t-shirt fundraising, college crowdfunders are able to boost their campaigns by creating unique apparel and designing compelling fundraising pages. Like typical crowdfunding, these pages are spread across the internet among family, friends, colleagues, and inspired strangers. 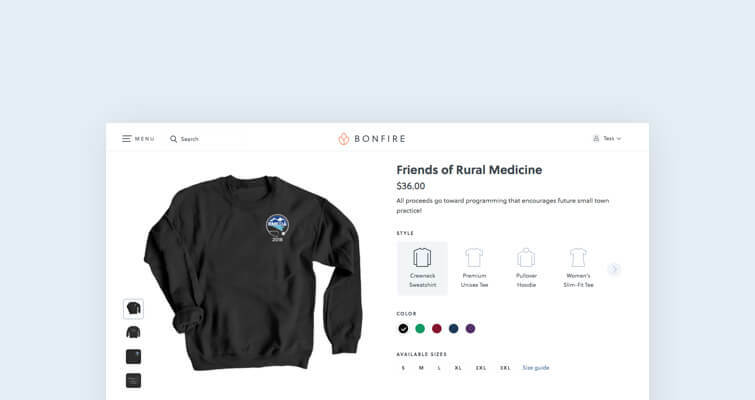 Since t-shirt fundraising depends on social sharing to gain traction, these campaigns are a unique way to spread awareness for your cause and reach the eyes of supporters who may not normally encounter your community online. Whether you’re an individual student or a large university, the social nature of t-shirt crowdfunders makes these campaigns the perfect method for getting your message out there and gaining sustainable supporters for future fundraisers. First, pick the right platform. You’ll want to choose a website that’s free to use, offers campaign customization, and helps you share your page with social media sharing tools. Additionally, choose a partner who offers a wide array of merchandise and allows your supporters to directly donate to your cause through your campaign page. Next, design beautiful merchandise. Depending on the kind of campaign you launch, you’ll want to have your pick of different apparel styles, colors, and other features to customize your products. Upload your own designs or create new ones using your platform’s apparel builder. After that, launch your campaign. In addition to designing your products, you’ll need to customize your crowdfunding page to reflect your cause. Set apparel prices and add personal touches to your page like a bio, logos, photos, and more to make your page more attractive to supporters. Then, spread your campaign far and wide. This is the most important step! Share your campaign on your website and social media pages. Additionally, call on proven supporters (like past donors, volunteers, students, and alumni) to share your page with their networks. Finally, start collecting fundraising revenue. Once you start making apparel sales or accepting donations through your page, you’ll receive your crowdfunding revenue. Most platforms charge shipping and payment processing fees at this stage; after that, you’re free to start accessing your funds! Need another reason to love t-shirt crowdfunding? Because these campaigns are so easy and affordable to set up, you have room to take risks in launching creative campaigns. This means that you can try all kinds of apparel designs, test different price points, and make adjustments as your t-shirt fundraisers go on to maximize the amount of support your efforts receive. In the long run, this equals greater college crowdfunding success and a stronger community to rely on campaign after campaign. 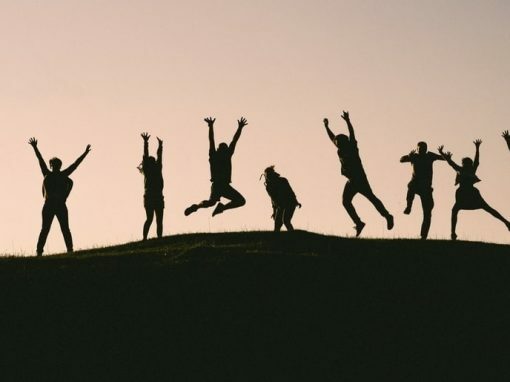 Now that we’ve gone over the steps you’ll need to take to get your t-shirt fundraising campaign off the ground, let’s review some of the best ways to implement this unique college crowdfunding strategy for university fundraisers as well as student campaigns. Bonus tip! When it comes to college crowdfunding, our t-shirt fundraising platform is second to none. Depending on whether your fundraiser is geared toward university or student causes, you’ll want to approach your t-shirt crowdfunding campaign differently. In the case of university crowdfunding, there are a number of ways that colleges can approach t-shirt fundraising campaigns to raise money. Let’s go over some of the top questions universities ask when considering t-shirt crowdfunding. What can universities raise money for with t-shirt fundraising? One of the benefits of launching a t-shirt crowdfunder for a college fundraising campaign is that your team can leverage this fundraiser to bolster a wide range of different causes at your school. How can universities raise money through t-shirt crowdfunding? Just as a university’s t-shirt fundraiser will benefit unique causes, these campaigns may also raise money through different revenue sources than, for example, a student’s campaign. Selling spirit wear. Create t-shirts, sweatshirts, and other apparel that help supporters show pride in your university. You can market this merchandise to students, their families, and alumni. Offering apparel for different student associations. Your school can set up campaigns for different student organizations, including clubs, alumni associations, Greek organizations, and more. Accept direct donations. Give supporters the option of making a direct donation on your page if they aren’t ready to buy merchandise or want to boost the impact of their purchase with an additional contribution. Note: Bonfire may only print university logos and trademarks with the direct consent of the copyright holder. Visit our content guidelines for more information. 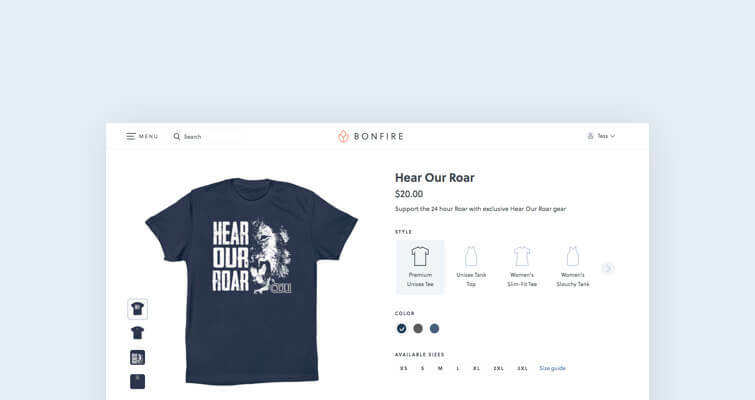 Bonfire is not a university licensed vendor and cannot print official university merchandise. Bonus tip! Ready to start searching for your university’s next crowdfunding partner? Visit Double the Donation to see their favorite university crowdfunding services for every school (Bonfire’s ranked as one of their top picks!). T-shirt crowdfunding doesn’t only work for large organizations like universities. In fact, t-shirt fundraising is one of the most effective ways for students to fundraise independently. What sets student t-shirt crowdfunding apart is that unlike university-wide campaigns, these fundraisers can benefit the individual or college-wide causes. Let’s go over some key questions about t-shirt crowdfunding for college students. What can students raise money for with t-shirt fundraising? One of the benefits of student t-shirt fundraising campaigns is that they give a platform to causes close to students’ hearts. Educational expenses. Let’s face it: school can cost a lot of money. Students can help offset the costs of higher education by starting a crowdfunding campaign. By fundraising for tuition, books, and room and board, students leave school with less debt. Academic projects. From creating a new club on campus to raising money for a study aboard program, there are plenty of reasons why students need funds for a project they’re interested in pursuing. Not only does t-shirt crowdfunding help you raise money, but it also makes people more aware of your project. Advocacy campaigns. If there’s a cause you’re passionate about, then why not consider raising money to support it through t-shirt fundraising. Multiple organizations create grassroots advocacy campaigns that put the control in students hands. All you have to do is raise money and awareness. How can students raise money through t-shirt crowdfunding? Since student fundraising campaigns have a greater emphasis on the individual behind the fundraiser than university-wide ones, it makes sense that the apparel students might sell is as unique as they are. Merchandise that celebrates life events. If you’re fundraising to finance a personal achievement like studying abroad or completing your last semester of college, you might design shirts that reflect this milestone. Apparel that’s specific to a cause close to your heart. Some students raise money by selling t-shirts that benefit a cause they care about and then donate revenue to nonprofit organizations or student associations dedicated to this cause. Uniquely-designed clothes with a personal touch. Many students opt to design beautiful apparel that shows off their personality or artistic talent. No matter the cause, supporters will love to buy original designs to uplift the student fundraiser. Bonus tip! Because student t-shirt fundraisers are driven by individual students, these campaigns can act as peer-to-peer fundraising opportunities. Universities might even call on students to set up t-shirt fundraisers to give back to their school. With t-shirt fundraising, college crowdfunding has never been easier. Whether you’re a big university or a single student, consider launching a t-shirt crowdfunder for your next college fundraising campaign. How to Ask for Money Online: 5 Easy Steps for Success. Asking supporters to give back to your cause can be tough, especially when university fundraising is involved. Check out our top strategies for making solicitations for all kinds of campaigns. Top 7 GoFundMe Alternatives You Need to Keep on Your Radar. GoFundMe isn’t the only crowdfunding platform out there. Check out our list of best-in-class crowdfunding platform alternatives to GoFundMe.